Fort Frederik - dates back to the 1700's and is Governor General Peter Von Scholten read the site where the proclamations abolishing slavery in 1848. The Market Place - an area of narrow streets and alleys which is one of the best places to appreciate the city's architecture. Many shops are located along this area. Other interesting buildings include the Old Customs House and Victorian House. Jump Up (also known as Harbor Night)- For a good time, try to go To "Jump Up" in Christiansted which is held several times a year. This is a "carnival-like" evening filled with steel bands, dancing, local arts and crafts, island food, and fun in the streets and waterfront of historic Christiansted! The Wharf - a seven acre area that forms the Christiansted National Historic Site. Fort Christiansvaern - the best-preserved fortress in the Virgin Islands. Built from yellow bricks brought from Denmark, the fortress has dungeons, galleys, cannons, and magnificent harbor views. Steeple Building - originally built in 1734 as a church, but later used as a warehouse, bakery, and hospital. It now houses a museum. Other historic buildings such as the Scale House, The Old Danish Customs House, and the West India & Guinea Company Warehouse - many are still in use. St. Croix Heritage Tours offers weekly walking tours or Christiansted and Frederiksted. Each walk lasts about 1-1/2 hours. The Christiansted tour starts at 9:30 a.m. on Tuesdays at the gazebo on the grounds of Fort Christianvaern. The US$12 fee covers all admission charges and a cold drink, half price for children 10 and under. The Frederiksted tour begins at 9:30 a.m. on Wednesdays, and starts at the end of the cruise dock. The cost is US$8. They also offer tours of Estate Mount Washington, the St. Croix LEAP woodcarving operation, and Estate Little Princess, which is owned by The Nature Conservancy. The groups range from 10-25 people, additional guides are hired on for groups larger than 25. For more information, call 778-6997. St Croix Heritage Trail - This 72-mile driving tour connects our Caribbean island's historic sites and attractions and includes many significant natural areas. Historic marker road signs with the trail's brown and white sugar mill symbol guide visitors along the route which runs between Frederiksted and Christiansted, primarily along Centerline Road, extending north to Hamm's Bay in the west and Point Udall in the East. Estate Little Princess - a 24-acre/9.6 hectare plantation belonging to The Nature Conservancy that overlooks Christiansted harbor. It contains 18th and 19th century great houses, water-well towers, sugar mills, and walking trails through native plants. Call 773-5575 or 7747633 for opening times. Captain Morgan Rum Distillery Tour and Tavern - The Visitors Center is located just off Melvin Evans Highway, on the south shore of the island. 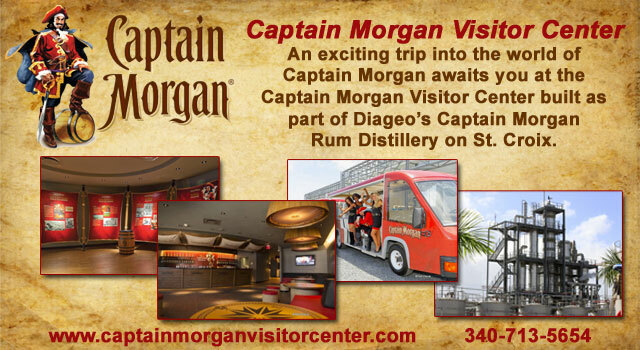 The Captain Morgan Distillery offers daily tours to learn about this fascinating craft. Come see how the globe's top selling rum is made and learn about the man behind the Legendary Captain Morgan Rum. St. Croix Leap/Rainforest - A unique woodworking shop in the rainforest north of Frederiksted is well worth the visit. Observe island mahogany and other locally grown wood being transferred into utilitarian and decorative items by skilled woodworkers and apprentices in this educational project. World Famous Beer Drinking Pigs of Montpellier Domino Club- Well they would get too drunk and now they can only have non alcoholic beer but it is still fun to see them drink it! They have been featured on Inside Edition and mentioned in Rodale's Scuba Diving Magazine, among others. Located in the middle of the rainforest on Mahogany Road (route 76). It's on the right if your are coming from the east (Christiansted) or the left if coming from the west (Frederiksted). From Villa Dawn it will be on the left. There is a $1 fee to see the 6 pigs, $3 to video them, and you buy their beer! You can eat there yourself (it offends the pigs if you eat pork there! Ha!) There is a full bar and local food for your enjoyment. Lawaetz Family Museum - Adjacent to the rainforest, this old plantation dwelling and its gardens depicts Danish West Indian life of the early 20th century. Guided tours 10am to 3pm Thursday through Saturday and the last Sunday of every month. Tuesday and Wednesday by appointment (772-0555). Admission $5.00, group rates available 772-1539. Point Udall - Experience the secluded eastern-most spot in the United States. The road was recently paved, but may not yet be open to vehicles. While in the area, look at the huge radio telescope across from Cramer Park. This is a 15 minute drive from Caribbean Dream. Estate La Grange - a unique attraction and marketplace in the historic buildings of a former sugar and rum factory. Home of Santa Cruz Beer and Don Santa Cruz Wines, tastings for visitors. Also art and crafts displays, gift shops, a rum museum, and a Pirate show featuring the infamous Don Santa Cruz. Open on cruise ship days, Small admission charge. Call 772-3663. Country Day School Gallery - has changing exhibits featuring the work of Virgin Islands artists.